The C.F. Martin Company only made a couple hundred of the Martin OM-18 Authentic 1933 Guitar that year. Now a 21st century replica of the guitar, one that is as true to the original as it can possibly be, is available. (Click here to read our review). Want to own one? 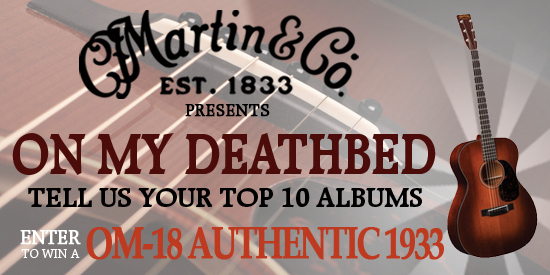 Simply click the button below and tell us the “ten albums you’d take to the other side,” and you’ll be entered to win a Martin OM-18 Authentic 1933 Guitar. Selected entries will be reprinted in our January/February 2014 issue. Deadline: December 15, 2013 at 11:59PM CST.